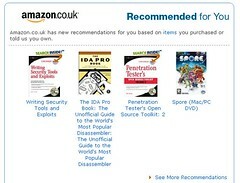 What Can I say 3 books on Hacking and Penetration and one on Spore Could it be any clearer Amazon wants me to hack Spore? Or do you need to be hacker to get past eh DRM after you buy it, after all we all know how crap the DRM on Spore Is. In fact So bad that I wont By Spore because of the DRM! Your not getting my cash to treat me like a criminal, I will go play something else instead.